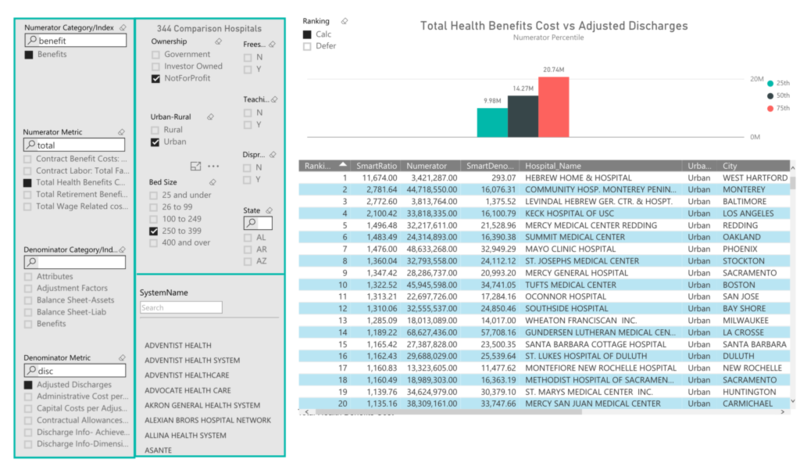 Simplified models provide access for visualizing metrics and gaining insight. Visualize performance geospatially for any metric in any market. Systems and affiliations layer by geography and performance. Analysis of performance quartiles for every data metric in the dictionary for 90+ provider cohorts for the most important demographic attributes. Build an in-depth view of any metric, or calculate performance rankings using custom cohorts that you design. 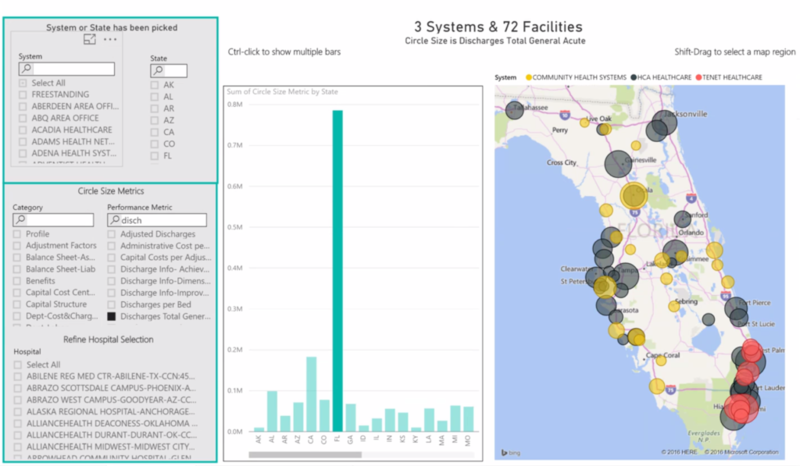 Select demographic attributes, location, system affiliation, or radius for any provider. 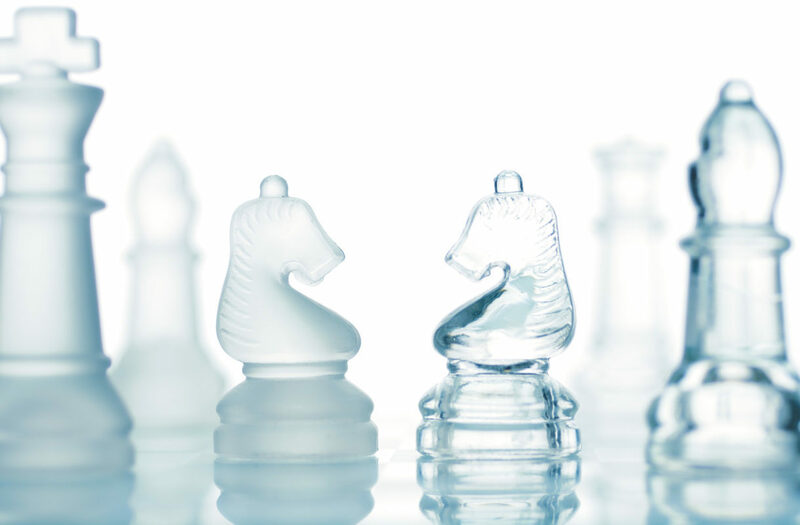 Profile a provider’s entire performance scorecard, compare to a custom cohort, another benchmark hospital, or a competitor or peer in a side-by-side comparison. Build National rankings and cohorts filtered by location for any metric. Answer the questions–how does a selected group rate and rank against National standards? Provide answers at the speed of thought about the comparative performance of the U.S. Hospital Industry. 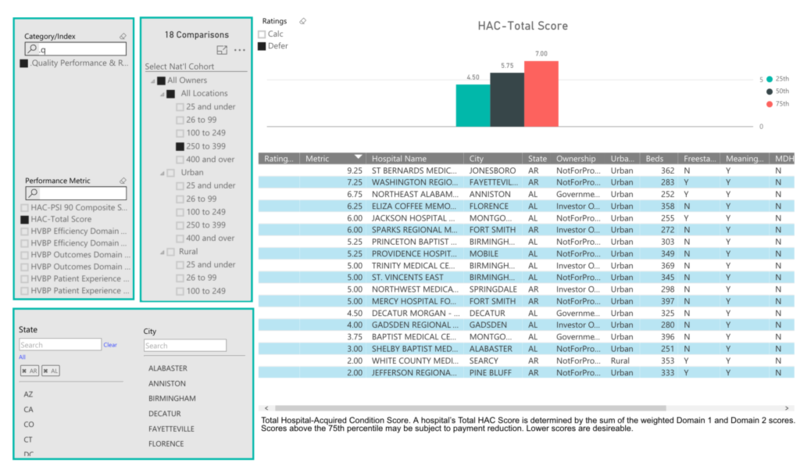 We extract, transform, and enable the big data of hospital performance making it actionable. We provide context through custom, local, national, and peer benchmarks. We enhance the content with proprietary methodology, such as risk adjustment, wage/labor adjustment, case mix analysis, and statistical significance testing, allowing for peer to peer informatics. We are differentiated on the speed and timeliness of our sourced content and we are disruptive in that we organize metrics to obtain answers. We extract Quality and Safety metrics from dozens of sources, monitoring for daily updates via API connections. 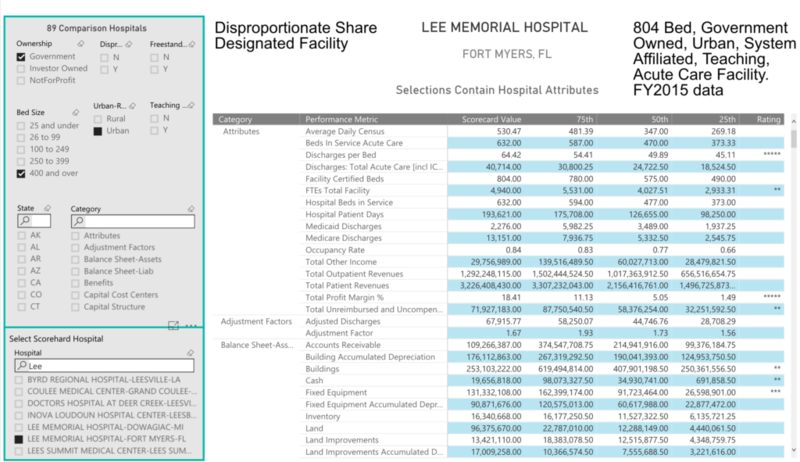 We use advanced data mining techniques, providing the broadest array of hospital performance insights. 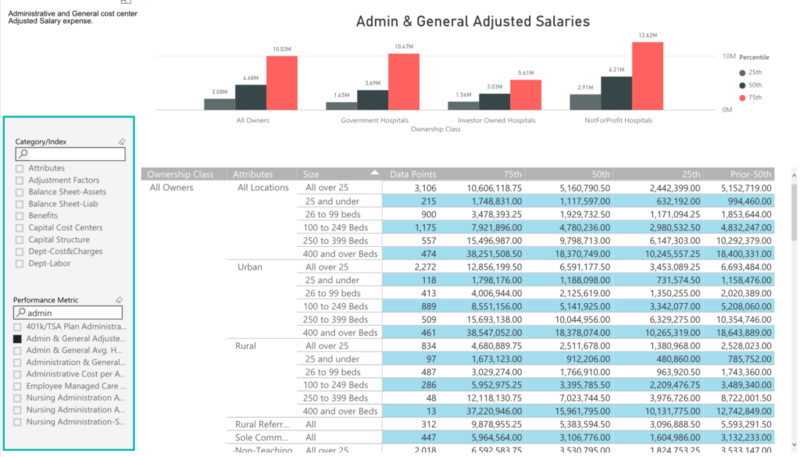 We deploy descriptive statistics and visualization using charts, maps, and dashboards. We enable users to build their own custom ratings and rankings for any performance metric. And we do it all at the speed of thought…allowing innovation in data discovery and performance transparency for: strategic planning, feasibility studies, market surveillance, portfolio monitoring, productivity analysis, marketing, and key performance indicator monitoring. Physician Prescription Profiles for Medicare Part D prescribing history for approximately one million prescribers identified by name and NPI. All NPI’s are geocoded and attached to their affiliated hospitals as reported. All Drugs (by generic and brand names) are delineated by specialty, city, state, spending, and prescription volumes. Our plans for development in this “vector” include providing context around patient diagnosis, market utilization, provider panels, and benchmarks for appropriateness and utilization by specialty. Own your performance. Own your message. Own your ratings. Join the evolution of transparent performance.